by Eunice de Souza. Penguin Books. Pages 132. Rs 195. WHAT a wonderful read this little book turned out to be! Not very impressive to look at, this innocuous-looking novel covers a whole range of human emotions — humour, friendship and sorrow. It also talks about the problems that the average urbanite deals with in relationships, how they work them out and how they deal with the business of living. 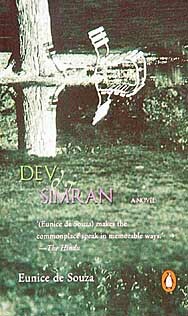 Dev and Simran is not just about the two characters whose names are mentioned in the title. In fact, the reader doesn’t even meet Dev except for a short while when he is on his deathbed. That is when Simran gives him the message from his friend, "Cheers! And one for the road", and then winces because it doesn’t sound quite right. Yet, Dev is there — emerging as a complete person through references by other protagonists, to him, his nature, his likes and dislikes, the core of his being. In truth, the author’s strength lies in capturing the core of many characters that come to life in the pages of the book. Among these is Dev who emerges as a laidback, cool husband, a friend who loves to hang out with his "adda pals", who, as a student, flunked in most subjects but preserved the report cards. "`85Lots of red lines and smarmy remarks: ‘could do better in Math, Science, History, Geography and Languages’". But Dev had unexpected nuggets of knowledge: "Could remember cricket scores from the year dot, could cook if he wanted to`85. And full of knowledge about cars, bikes, gizmos of every kind"
Simran, his widow, is left grappling with the loss of her husband too soon after the death of her baby daughter. "Sara’s death made me feel punch–drunk, both eyes bleeding". She doesn’t feel the need to "do" anything to make herself useful. She regrets that she didn’t talk about a whole lot of things that she ought to have with her husband. She realises that her marriage wasn’t a perfect one, "Making love? A matter of affectionate tolerance sometimes, irritated tolerance once in a way when I was zapped, or he more interested in watching TV. Once in a long while, the Real Thing". However, she misses her husband so terribly that it takes her six months to get over being a "zombie". "A quick and easy death. Easy for whom?" she wonders. Then there is Maya who must spell out everything whether at work or in relationships, explain everything and also get into the nitty-gritty of things. "`85I don’t like things which are unclear, unfinished". She’s a tough but confused woman — a woman who has her own confused view of Dev and Simran’s relationship, her favourite lines being, "‘The imperfect is our paradise.’ No perfect husbands, No perfect wives. No perfect life. No perfect death. No perfect world. What to do? Bumble on." All the important people in the periphery of the couple’s lives keep appearing and interacting with each other. Maya, Peter, Deblina, Ved, Vimi, Rishad, even Dev’s mother with her "long suffering smile", whom we meet through references to her by the characters in the novel, are fully etched, real, interesting, alive people. They talk the language of the modern Mumbaikar, share urban concerns, and are affectionate and sometimes rough and critical with one another. Their paths criss-cross with each other. What is common to all of them is their concern about Simran after Dev’s death. They all have their own views about how Simran should deal with her grief and they all have their own ways of showing concern. "Simi’s friends (and she has many) are determined she should not have time to think. We take her out to lunch, tea, dinner, films, plays, parties. Simi comes along. She knows we mean well." A major part of the novel is in the form of letters and e-mails that the characters write to each other. Ordinary letters about their lives, decisions, interactions, reactions to people and situations. Simran’s letters to her dead husband are especially poignant as she struggles to deal with his loss and the memories he has left behind and examines the many facets of their lives and marriage. She writes, "I think I short-changed you" or after reading a poem, "That’s why relationships go wrong don’t they? Or can go wrong. Missed signals, confusing signals`85" or, " Other people’s grief doesn’t help in the end. It’s a long road, and one walks it alone." In spite of the theme that she has chosen, Eunice de Souza never drags the reader into a quagmire of grief. It’s a brave little book, in fact. Even Simran’s introspective letters to Dev are not an exercise in self-pity but dwell on past experiences, present situations, her interactions and relationships with friends etc. The book comes smiling through. The smile may sometimes be a little lopsided, sometimes explode into a loud guffaw and sometimes turn a little wintry or a little teary, but always remains in place.